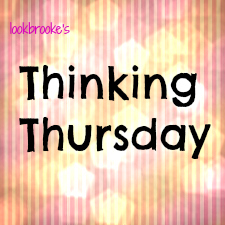 I have decided to start a new weekly thing, "Thinking Thursday" where I post a quote, bible verse, song, blog post, etc... anything that really got me thinking. Something I want to share with all of you! So let's raise a cup of coffee and clink over the first "Thinking Thursday." Resist the urge to compare, and instead embrace that this dream is between you and God. He doesn't want you to change who you are to be someone else. He simply wants you to become all he's created you to be and trust that means you will have everything you need to make this dream come true.... You are a one-of-a-kind wonderful. You are chosen by God for a particular purpose, and he promises to see it through to completion if you'll only say yes to what he's whispering to your heart and your heart alone. That was taken from Holley Gerth's You're Made for a God-Sized Dream. This book has truly blessed my life, it's great to take a few minutes out of your day and read this along with my bible and my other book I am using as a devotional (Check it out! This book is AMAZING!) Anyway it really made me think about my dreams and how God can truly open doors if you follow his will for your life and listen to him and if he wants you there... you will be there. love this idea! can't wait to follow along for them! Thanks! Love your posts about NYC!